Glioma is a malignant type of primary tumor that occurs in the brain and spinal cord. Gliomas form from the glial cells, the tissues that surround and support the brain neurons. A glioma is a primary brain tumor that originates from the supportive cells of the brain, called glial cells. Glial cells are the most common cellular component of the brain. Astrocytoma- The most common type of glioma that develops in the connective tissue cells called astrocytes. Glioblastoma Multiforme- This is high-grade astrocytoma and the most malignant form of glioma. Brainstem Glioma- The glioma that develops in the brain stem. Ependymoma- The glioma that develops from ependymal cells. Mixed Glioma- The glioma that develops from more than one type of glial cell. Oligodendroglioma- The glioma that develops in the oliogendroctyes, the supportive tissue cells of the brain. Optic Nerve Glioma- The glioma that develops in or around the optic nerve. There is no know common cause for glioma. However, it is known to affect all ages and occurs more commonly among Caucasian male adults. 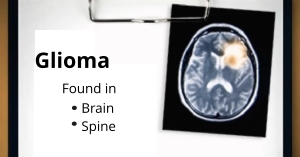 Symptoms of glioma depend on its size, grade and location. Gliomas in the brain can cause various symptoms including nausea, vomiting, headaches, light flashes, seizures, dizziness and fainting spells. A glioma in the spine may cause pain, weakness, and numbness on the limbs, while a glioma that pressing on the optic nerve may lead to vision loss. Symptoms of glioma become apparent slowly. It must be noted that some gliomas do not cause any symptoms and might be diagnosed or discovered while seeing the doctor for another condition. Ependymoma- In babies, increased head size may be one of the first symptoms. Irritability, sleeplessness, and vomiting may develop as the tumor grows. In older children and adults, nausea, vomiting, and headache are the most common symptoms. Mixed Glioma/Oligoastrocytoma- The initial symptoms, including headache and nausea, usually are the result of increased pressure inside the brain. Vision problems, as well as changes in behavior and personality, are also fairly common in mixed glioma patients. Oligodendroglioma- Because of their generally slow growth, oligodendrogliomas are often present for years before they are diagnosed. The most common symptoms are seizures, headaches, and personality changes. Optic Glioma- These tumors may cause few or no symptoms. Their placement along the optic nerve, however, can cause vision loss (depending on the location of the tumor) or strabismus (“crossed eyes”). Hormonal disturbance might also occur, causing developmental delay(s), early puberty, and other symptoms. Initial treatment will involve thorough medical history and physical exam, including the patient’s symptoms, personal and family health history. To help detect meningioma, Robert Louis, MD conducts a neurological exam to test a patient’s vision, hearing, balance, coordination, reflexes, memory and the ability to think. Special imaging using Magnetic resonance imaging (MRI) and computed tomography will be required to detect glioma. Once glioma is detected, Dr. Louis will perform a biopsy to obtain glioma tissue for examination by a neuropathologist to establish exact composition and grade of the glioma. This process is crucial as it will dictate the best course of treatment and will also give important information about prognosis. Special imaging, such as Magnetic resonance imaging (MRI) and computed tomography (CT), which use computers to create detailed images of the brain, are the most common scans used to diagnose brain tumors. Treatment of glioma by Orange County neurosurgeon, Robert Louis, MD, will depend on the location, type and size of glial tumor and the patient’s overall health condition. Most gliomas can be surgically removed through one of the minimally invasive keyhole approaches. Robert Louis specializes in minimally invasive removal of glioma. Less invasive keyhole surgical approaches incorporates Dr. Louis’ experience and education with cutting edge technology and instrumentation. Endonasal Endoscopy- A technique that allows an endoscope to be threaded through the nose and sinus to reach and remove meningioma in various areas of the brain. When it is not possible to operate or remove the glioma completely and safely because it’s located in a part of the brain that can’t be operated on, radiation is the next best treatment option. Dr. Robert Louis specializes in minimally invasive brain surgery for the treatment of glioma. For appointments, please call (949) 383-4185 or Contact Us.